I was born and raised in Richmond and have a loving family with a mom, dad and two older brothers. Growing up, I enjoyed sports, and took part in the swimming, wrestling and cross country teams. I was also in the Marine ROTC program at Tucker High School. I started working at age 14, landscaping for Three Chopt Pool. At 16, I worked at a local Exxon where I became manager and ran the station’s U-Haul business. After graduating high school in 2000, I enlisted in the United States Marine Corps, knowing I wanted to learn the trade of mechanical work in the aviation field. After boot camp, I was sent to AH1-W Cobra and UH1N Huey School, and my work with helicopters began. For most of my military career, I lived in Jacksonville, NC, taking care of over 30 aircraft. I served two tours of duty – seven months on a Navy ship and seven months in Iraq. In 2005, I left the Marine Corps as a sergeant, taking great knowledge and many wonderful memories with me. 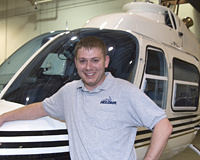 In 2006, I attended the Baker Aviation Airframe and Powerplant School in Nashville, TN. Shortly after finishing, I started my career with HeloAir, where I continue to learn new things every day through interacting with our wonderful team and traveling all over the state and country. My experiences range from fire fighting and maintenance in Tallahassee, FL to training at a Bell 407 school in Fort Worth, TX. I am currently 26 years old, single and just bought my first house in the West End. I’ve had many adventures in my seven years of helicopter experience. I couldn’t be happier in my life and in my job.